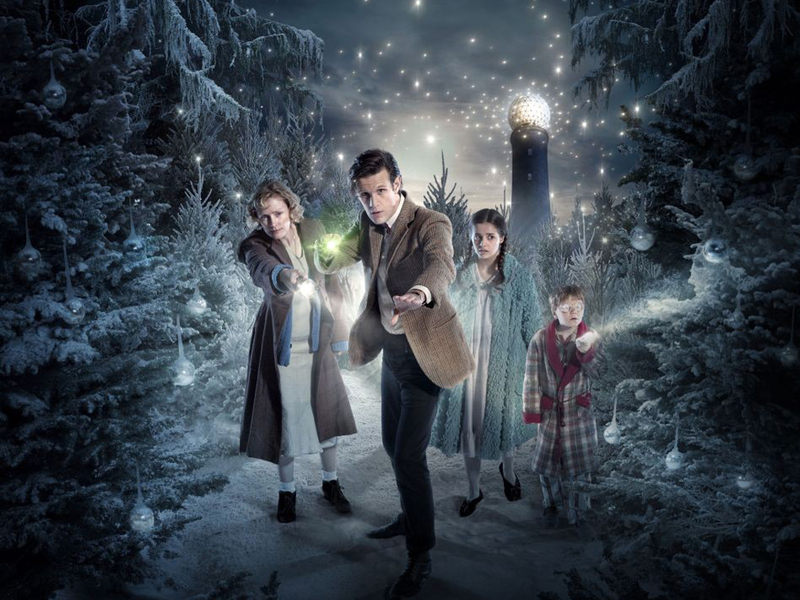 The Doctor Who Christmas special has quickly become a must-see annual tradition. Yet for all the splendour and sometimes important storylines that the previous specials have dealt with, ‘The Doctor, The Widow and the Wardrobe’ manages to feel more classically and quintessentially Christmas-y than any other. Following a slightly bigger opening in which Madge Artwell comes across a crash-landed Doctor and helps him back into his TARDIS, prompting a debt to be paid later, time jumps ahead a few years and the story begins to focus in on Madge herself, played fantastically by Caroline Skinner. She has just received news that her husband has died on the frontlines, facing the conundrum of both having to spend Christmas without him and having to find a way to tell her children of the loss. The Christmas special is by necessity something completely different from the proper series, and here Matt Smith is allowed to bring some levity and light-heartedness back to the role after having to carry so much emotional weight throughout the last few episodes. Companionless as still obviously affected by what has occurred to him, the Doctor nonetheless brings out a childish glee as he fills a Mary Poppins role for Madge’s children Lily and Cyril, particularly as he gives a whirlwind tour of the house he has tinkered with, the children’s bedroom being his ultimate focus for wonder. Child actors tend to be rather hit or miss, but full credit must be given to the casting director and to director Farren Blackburn who manages to bring out the best in the two young cast members. Maurice Cole, in particular, steals just about every scene he is in with his looks of innocence and wonder as much as his dialogue. There’s certainly much wonder to be had as the children crawl through the Doctor’s mysterious present to them and enter a world inspired by- as the title of the story would suggest- Narnia. The story arguably takes a bit of a downturn when the monsters appear after the joy of the house and the spectacle of the wintry world through the box, though Moffat again does a nice job of twisting conventions and expectations. There’s another trio of guest cast members in this portion of the tale, but sadly they are so underused, especially considering the name value that Bill Bailey brings, that they are ultimately forgettable. Fortunately, the wooden creatures in this land are far more effective, evoking a sense of grandeur and dignity through their more stoic presence. It, of course, is the scene in which Madge gains control of a large piece of machinery to save the day that will be discussed for better or for worse, clearly a scene not meant to be taken too seriously but still managing to portray how strong a mother’s love truly is. And love really is what the story is all about. The denouement is handled very well and, considering how engaging the Artwell family is, it’s fitting that the ending of the story is a heartfelt and tender one rather than a heartbreaking and tragic one for them. It’s touching, too, that the Doctor chooses to reconnect with Amy and Rory after two years apart. Their Christmas meal together is the perfect ending to a turbulent string of events for the Doctor, and though it appears his time with Amy and Rory is drawing to a close, the strength and recommencement of their bond should continue to carry more stories in the future. Peace and goodwill is clearly in abundance, and that’s Christmas in a nutshell.